Max and Voltaire: Getting to Know You is the first in a series of illustrated books about how embracing both the familiar and the different can make our lives interesting and rewarding. The messages about making new friends, adapting to change, fostering tolerance, lending a helping hand and getting along with others are gently handled through the eyes of Max (a cat) and Voltaire (a dog) and a supporting cast of furry friends and bipeds. Max and Voltaire: Sightseeing and Catnapping is the second in a series of illustrated books featuring Max and Voltaire, and their first travel adventure. Max and Voltaire go to the south of France. They discover not only new landscapes, but also the rewards of caring for others and coming to the aid of those in need. They solve a mystery, save a kitten in distress, and make new friends. Max and Voltaire: Voyage to the Eternal City. Visit Italy with your friends Max and Voltaire. They travel to Padua, Bologna and Rome, the Eternal City, where they learn about Italy's history and heritage. They renew friendships and make new ones. 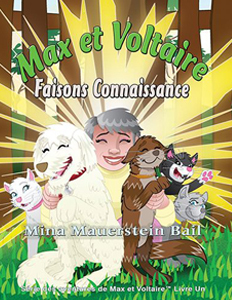 Max explores a cat sanctuary and Voltaire goes to a dog beach! Max and Voltaire: Treasure in the Snow. Visit Explore the French Alps with Max and Voltaire, and their furry pals. Voltaire is reunited with Bella. Max and Say What solve a valuable clue and Tish treks through the snow to rescue Zoa. Max and Voltaire: Meet A Wise Old Bird. Join Max and Voltaire with their furry pals Say What, Tish and Zoa on their visit to Aix-en-Provence where they meet a wise old bird and learn about art, following your dreams and elder wisdom.